Protecting your trim and tires couldn’t be easier! Blackfire Trim & Tire Protectant is any easy to use product that will apply a durale layer of protection to your tires, trim, and other hard plastic surfaces. Blackfire Trim & Tire Protectant's unique formula works quickly to penetrate deep into the pores of your trim and tires to refresh their look, effectively protect them, and leave behind a subtle matte finish. 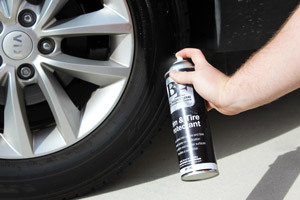 Blackfire Trim & Tire Protectant can be applyied in mere minutes thanks to its spray on, walk away application process! 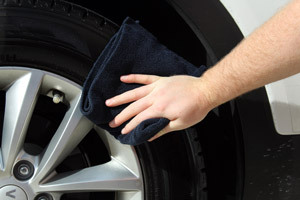 Your tires and trim are quite a hassle to keep up with as far as looks and cleanliness are concerned. These surfaces are quite porous, meaning they are going to soak up every bit of dirt and contamination that crosses their path. On top of that, this porousness means that instead of locking in moisture, they dry out quickly. Once they dry out, cracking and fading are likely to follow. Instead of getting them replaced as soon as they being to turn brown or white, you can simply keep them thoroughly protected with Blackfire Trim & Tire Protectant! 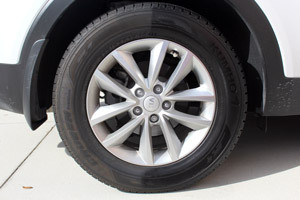 BLACKFIRE Trim & Tire Protectant acts as both a cleaner and protector for your tires. Have brown-stained tires? Simply spray BLACKFIRE Trim & Tire Protectant to restore and protect! Blackfire Trim & Tire Protectant acts as a protective barrier that penetrates into your tires or trim, blocking the pores there and preventing any dirt or contamination from being absorbed. By blocking the pores in your trim and tires, Blackfire Trim & Tire Protectant will also lock in any moisture and keep them from drying out and becoming faded. When Blackfire Trim & Tire Protectant fills the pores, it will also revitalize and restore any fading that may have already occurred. Your exterior rubber and trim are the ones that will need the most protection and cleaning, but your interior surfaces still need attention. You will be able to use Blackfire Trim & Tire Protectant on pretty much any rubber or plastic surface in or on your vehicle. Blackfire Trim & Tire Protectant can be used on your exterior trim, your tires, rubber molding, your grille, your wheel wells, and even your engine bay! Restoring faded trim is just as easy as applying to your tires! 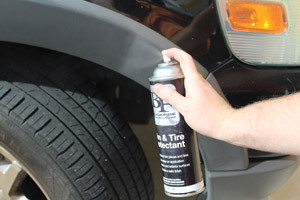 Simply spray BLACKFIRE Trim & Tire Protectant directly onto the surface to be treated and wipe away! Not everyone enjoys a flashy, high-shine finish to their vehicle surfaces. Blackfire Trim & Tire Protectant is sure to please those of us who prefer a more muted look to their trim and tires. 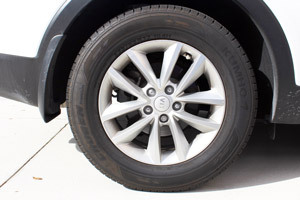 Blackfire Trim & Tire Protectant has a brilliant satin finish that will compliment any paint job! Clean the surface to be treated with BLACKFIRE APC All-Purpose Cleaner before application. Spray a product directly onto a microfiber applicator or towel and apply to trim using an even back and forth motion. Buff off excess product using a dry microfiber towel. Multiple coats will provide a higher shine.